The musical calamity has had to postpone its opening date four times in order to work out all of its complicated safety measures and myriad technical components. The latest opening date so far is March 15. But that has not stopped a growing rank of critics impatient with the production’s delayed preview process to prematurely review the show. Also writing up the equivalent of bad tomatoes are Variety, L.A. Times, Chicago Tribune, Washington Post and New York magazine. The lone holdout is the Associated Press–sticking to tradition and waiting until the show is frozen before reviewing it. 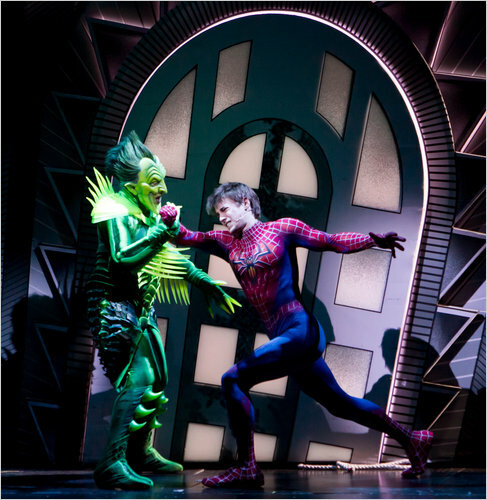 That is usually the case for most theatrical productions, but Spider-Man has created a unique exception for the press. The show has already generated a mountain of publicity that the critics had no choice to take a look at it themselves. I believe they will take a second look for a “progress check” after the official opening, but what’s the point then? Audiences are automatically flocking to the Foxwoods Theater in droves, making it an instant blockbuster musical. The show recently joined the $1 million club, alongside Wicked, The Lion King and The Addams Family, regularly selling out its performances with weekly grosses at $1 million a week. Those disaster-seeking audiences at Spider-Man are there for the bad press anyway. Bad press=deathly spectacular? Amid reports about actors and stunt doubles falling to injury right on top of the audience’s lap, that would probably make for a cool night of theater: the real-life drama, the stunts gone awry, Spider-man flying over the balcony, another technical stoppage to clear out another body! Joan Rivers herself attended a performance of the show last week. One of her wisecracking notes to beleaguered director Julie Taymor was to have performers fall from the rafters to sustain the publicity and thrills. Also some helmets being sold at concessions would help. So if you do decide to attend a performance of Spider-Man, watch it at your own risk.